A woman standing near her vehicle on the shoulder of Interstate 90 was struck by another car and was taken by helicopter to a hospital, according to the Washington State Patrol. The incident occurred about eight miles west of Sprague in Adams County on Monday evening. The State Patrol release said that two people – 21-year-old Brianna Harper and 18-year-old TJ Benavidez – were stopped on the eastbound shoulder and standing outside their 2016 Chevy Malibu. Richard Boring, a 76-year-old man from Georgia driving a 2007 Chevy Silverado, drifted onto the shoulder and hit the Malibu and Harper. State Patrol said there is no indication that any crime was committed, Boring simply drifted off the road. Troopers said it does not appear that Boring was under the influence of drugs or alcohol. Harper was taken to Providence Sacred Heart Medical Center in Spokane. Boring and Benavidez were uninjured in the crash. According to statistics from AAA, an average of about 610 people die each year on the shoulder of highways. 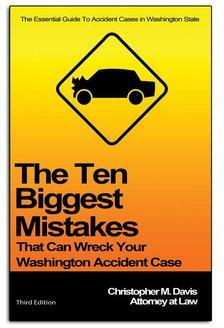 That’s approximately 12 percent of all interstate highway deaths. Unfortunately, pulling over on the side of the highway is usually an unavoidable occurrence, as no one wants to find themselves in that situation. If it’s not an emergency, don’t stop: It goes without saying that pulling over on the highway is dangerous. Highway drivers, especially at night, are often fatigued, and reaction times can be slow. Judging distance can be difficult. If you have a flat tire, it’s recommended that you continue and find the nearest exit. While that move may damage your wheel or rim, it’s safer than pulling over on the highway. Pull off the road as far as possible: If you must pull over on the shoulder, get as far off the highway as possible. It’s traditionally safer to be on the right shoulder than the left shoulder. Once you’re off the road, have all the passengers get out of the vehicle and stand away from the vehicle as soon as possible. Lingering near your car, as the two people did in the car accident above, is dangerous. If there is a guard rail, have everyone climb over it to protect themselves. Make your car visible to others: Use your hazard lights. If you have flares or other reflective safety items, use them. You may even raise the hood or tie a cloth around the antenna to make yourself more visible. As you can see, the shoulder of a highway is not a safe place to be. Injuries can be very serious due to the high rate of speed. Be aware of the dangers, and proceed with caution if you see a disable vehicle. Attorney Chris Davis and the legal team at Davis Law Group, P.S., represents people who have been seriously injured or suffered from the wrongful death of a loved one. If you have suffered a catastrophic injury as the result of negligence by another person or entity, we can help you recover fair and just compensation you can use to get your life back on track. Call (206) 727-4000, use the chat feature below or fill out the contact form on this page for your free case evaluation.